As many of you know, I love upcycling furniture with Annie Sloan paint. I use this paint because it doesn't involve sanding or undercoating - you just slap it on and away you go! I have recently had a bit of a binge of painting pieces of furniture that I've been procrastinating about for nearly a year. My favourite Annie Sloan colours are Graphite and English Yellow. This 50s cabinet was first up - English Yellow at the back and Graphite everywhere else. I was given this piece of furniture by someone who was getting rid of it and I was going to sell it but I rather like it now that it's painted. No distresssing on this piece, just Annie Sloan clear wax. Next up was this little vintage Hungarian table which I use for my printer. It was already painted in a hideous yellow gloss paint (sorry no "before" image) so I decided to give it a dousing in English Yellow with distressing. While I was on a roll with the English Yellow, next up to get a dousing was a gilt mirror that I bought in a second hand shop two years ago for £20. I fancied something different and fun so it certainly scores on both these points. I may add more dark wax into the crevices but for now it gives a lovely sunny warmth to the kitchen. Next up, my workstation. This is a cupboard that I use for my work and the yellow mirror sits on top of it. It was painted in a dark grey gloss paint and I prefer a chalk paint finish. Once again I used Graphite. However this colour can look a bit dull on some textured furniture and that's what's happened here. This can be resolved with a coat of dark wax over the clear wax. The biggest success was the next item, a gilt mirror that I have had for 5 years and never really liked. Sometimes it's all about trial and error when painting furniture so do have a go. Mix colours together, put one colour on top of another, use a wash (diluted 50/50 paint/water) etc etc. On this mirror I've used Aubusson Blue and Old White then clear wax and dark wax. It is a stunning transformation and the shape of the mirror is really enhanced (sorry no before pics). The jury is out on the next piece - I don't like the finished look. The table was originally a light grey/green colour when I bought it (first image below), then I painted it Graphite. I should have left it at that because now the effect doesn't suit the elegance of the table. So it's back to the drawing board with this piece. As I say, trial and error!! I'd love to hear about pieces of furniture that you have painted in Annie Sloan and see some images so do share them with me. It's way too long since I last painted something for my home so I've lined up several items, the first of which is this wooden tray that I purchased from Petersham Nurseries a couple of years ago. Don't get me wrong, it's a nice wood but it had lost its appeal so I wasn't using it so I fancied a change. Actually these are the trays that they use at Petersham Nurseries in the cafe when you buy your coffee, cake or lunch and they suit that environment as it's very rustic but it doesn't suit my home. I usually paint with Annie Sloan paint as you don't need to key (rub the surfaces with sandpaper) or undercoat, you just slap on the paint, on any surface! However the Annie Sloan range of colours doesn't include a purple/aubergine colour (something I think they need to address) and I couldn't be bothered to mix the appropriate colours to create purple, so I decided that this time I would use Farrow & Ball 'Brinjal' which is a gorgeous aubergine colour. I ummed and ahed about whether to distress the edges of the tray to bring through some of the wood but decided it would be too much of a vintage look so I opted to paint it all over. and then used Annie Sloan clear Soft Wax which is a wonderful wax and way superior to any other clear wax I've ever used. And voila, here is the finished article. Isn't it stunning?! I love the way it works so well with the colour of the cyclamen and the vintage bowl which I purchased this week from Charlie McCormick's popup shop. I'd love to hear about things that you are painting for your home, what paint you use, what colours and paint finishes you like so do email me with your comments. I'll create a separate post for some more items that I'm currently painting. Happy Sunday everyone! It's a gorgeous morning here in London (for a change) so I'm up early, had my usual hearty Sunday breakfast of eggs cooked with garlic, chilli, spring onions and tomatoes washed down with a pot of tea and I'm ready for the day. I've been pretty slack in the last 12 months with my up-cycling with Annie Sloan paint. I have so many small items that are waiting to be painted so I thought it was time I got out my brushes and paint and worked on them. I started with a couple of small, quick and easy items - two wooden trays. My default Annie Sloan colour is Graphite so I decided to paint both trays in this colour. One tray was already painted in an Annie Sloan colour 'Old Violet' but I wanted to change the colour to Graphite and use it to display all my Cloth Shop Swedish linen napkins on the kitchen table. That's the great thing about Annie Sloan paint; you get tired of the look of an item so you paint another colour on top of it - no faffing around with sanding or undercoating, just paint directly on to any surface, be it wood, metal, china, glass, walls etc etc. You can distress the paint finish with either sandpaper or just by rubbing hard with the Annie Sloan Clear Soft Wax. Youtube is full of short videos of how to paint and wax with Annie Sloan so if you've never used the paint before, have a look at some of the tutorials on Youtube. I now love watching my guests choose a napkin to use at the table - they um and ah for ages because all the colours are so beautiful they can't decide. No-one ever picks the beige napkin though! The tray of napkins makes a great centrepiece for my table, don't you agree? The other tray is an Edwardian wooden tray with metal and wood handles that I picked up for a tenner in a second hand shop. I painted a layer of Annie Sloan English Yellow first and then a layer of Graphite so that I could bring some of the yellow through on the rims of the tray for a more interesting finish, as you can see in the images below. I didn't paint the handles as they are too nice to paint. This tray is a gift for one of my clients. I was seriously toying with keeping it as I love its shape. I understand that not everyone has the time or inclination to paint furniture. I am happy to help if you have any questions or concerns, and am available to revamp your pieces that need a new lease of life. Get in touch to have a chat with me. What is it about the colour grey and the current obsession with using it everywhere in the home (I admit that I've fallen foul of it myself!)? I can accept that you might want to use it in one or two rooms but not a different shade of grey in every room, with little or no thought to whether the room is sunny or dark and no pops of colour out of fear to introduce colour. Even the mirrors and light fittings are lacking in colour! Don't get me wrong, I love the colour grey and a year ago I changed my sitting room walls from off-white to grey (Farrow & Ball's Cornforth White) and all the furniture, window dressing and accessories accordingly. It's a very sunny room; with plenty of colour (purple and gold) in the furniture and accessories, the room does not feel clinical or cold. Here are my sitting room before and after photos - transformation from beige to grey! I manage a local interiors shop twice a week in which we sell up-cycled furniture. It seems that most of our customers have some or all of their rooms painted in a shade(s) of grey (usually Farrow & Ball)! There is a definite "sheep" mentality going on where people are painting grey rooms because they've seen it in a friend's house and don't want to be left behind. They therefore want the furniture that they buy from us to also be painted in grey shades. We therefore have moved away from painting furniture in the yellow or red based Farrow & Ball neutrals to the greys or colours with grey undertones. These tend to be more contemporary than the traditional red and yellow based neutrals. There is a definite trend to transform homes into more contemporary spaces - open plan living, mid-century furniture, natural surfaces like concrete ..... However a lot of people are afraid to introduce colour and these grey interiors appear flat and dull. What these interiors need are pops of yellow, orange, purple, turquoise, pink, red .... in fact any colour and what about a bit of that gilt to warm up the room in a mirror or chandelier? I always recommend to my clients when doing colour consultations that they start introducing colour with small items that can be removed/replaced easily such as cushions, flowers & plants, vases etc. There's nothing more beautiful than a bowl full of fresh lemons (and limes) to add a pop of colour to a grey interior. 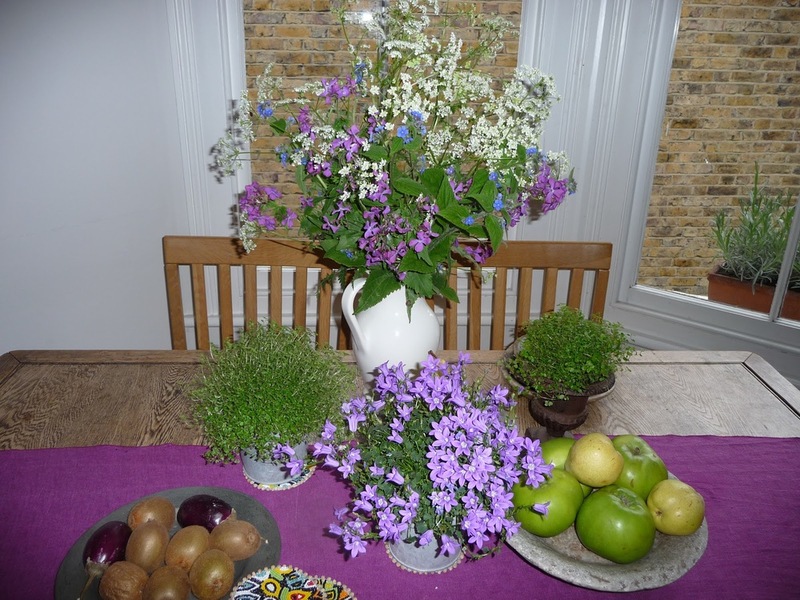 I love colour and don't stick to rules, rather am guided by my gut instinct and my love of flowers (I find nature to be the best inspiration for how to use colour). It's very rewarding when I can convince a client to introduce some colour and to see their reaction to the way it has enhanced the room. Shock-horror followed swiftly by a broad smile. Warms the cockles of my heart to see these reactions! If you are thinking of painting a room grey, think of what colour(s) you will use to complement the grey. For example, a grey with lilac undertones (Farrow & Ball 'Skimming Stone' or 'Elephant's Breath') looks superb with pops of purple, turquoise or pink. I recently painted my bathroom Elephant's Breath and have added pops of turquoise and purple in artwork, mirrors and towels. Be a trail blazer, break the "sheep" mentality and be the first of your friends to introduce colour into your grey interior. Trust me, you won't regret it. If you don't have the confidence to do it alone, I'm happy to help. Give me a call or drop me a line. This once very boring, modern pine mirror was just crying out for a makeover. Have a go at painting with Annie Sloan paint. It's so easy and VERY satisfying! Here I showcase how I updated some pots around the house with a selection of sample paints I had. When the weather is glorious —like on the most glorious spring-like day — my flat is bathed in sunlight. It seems to be full of flowers and plants so I couldn't resist photographing them all and sharing them with you. 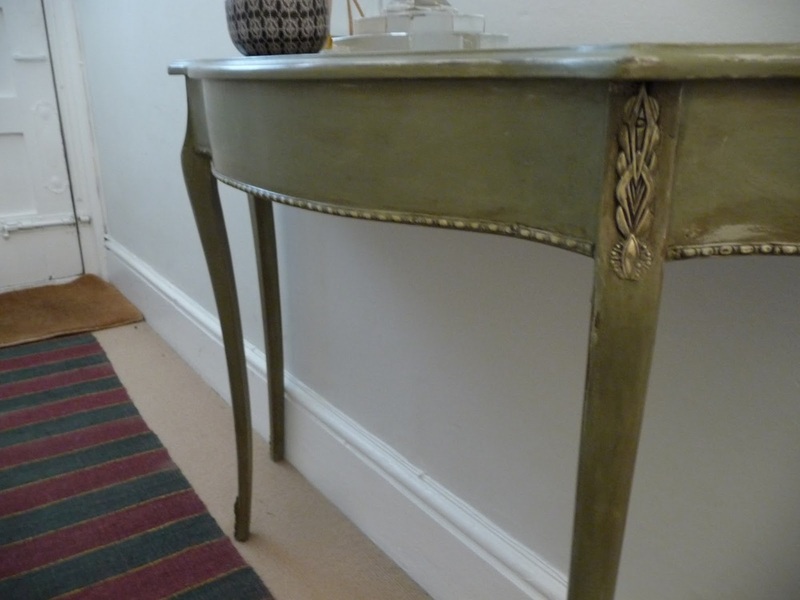 I have a small console table that I bought painted in Farrow & Ball paint. However it was a bit one-dimensional and not distressed enough for me so I have now transformed it. You wouldn't recognise these revamped chairs as being from Ikea. See how I transformed their modern look into something more suited to my beautiful oak table. Rather than head straight to the charity shop to drop off your old items, think about whether you might be able to give it a little spruce up for a fresh new look. Here's what I did with an old tray table and some Annie Sloan paint. Mahogany sideboard painted in two coats of Aubusson Blue and one coat of Florence plus clear and dark wax. In this post, I showcase a number of small items that I've shown a little love. I wanted you to see what you can do to brighten up your decor with so little effort!